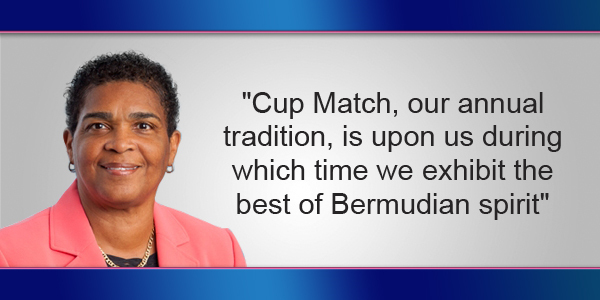 Cup Match, our annual tradition, is upon us during which time we exhibit the best of Bermudian spirit. For some, the holiday provides the opportunity to fellowship with family and friends. Whether camping at their favorite location, boating or swimming in our pristine waters observing revelers on their way to the match while tuning in to the commentary or enjoying their favorite music, we share the excitement and the food! For others, the match cannot begin until they have vetted the teams, inspected the wicket, donned their blue and blue [or red and blue] and settled in to watch first ball. Heated conversation is the order of the weekend in expressing support for our team or predictions of the outcome. However we celebrate, we ask you to embrace our visitors in true Bermudian style, spare a thought for those who have to work and for those who travel the roads. We encourage responsible behaviour, consideration for others and please do not drink and drive. Whether “Up she comes” or “howzat?” my colleagues and I ask you to be safe and enjoy the holiday. The oBA/UBP is finished the BDA party needs to form again and distant themselves from these jokers. Why should they be considered ‘finished’ ? Did the PLP go the way of the dodo in 1985 when it was UBP 31 PLP 7 ? Why would you not say anything about Emancipation in your well wishes for the upcoming 2 day holiday? This is why I voted for PLP this time (prior OBA supporter). Terribly disappointed in what the OBA shows as their priority. Yes , while I agree we ‘exhibit the Bermudian spirit’, we also acknowledge how we got to where we are from once we came (particularly at Cup Match).